This paper presents a method to evaluate the exact stationary solution of a single queue with preemptive-resume priorities and finite source. In the case of an infinite source (Poisson arrivals) the solution is given by a well-known simple formula. 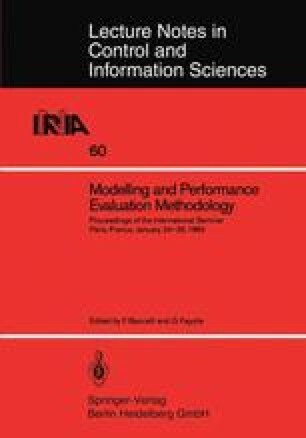 Models requiring finite customer populations are frequently used for computer performance evaluation (i.e. a processor shared by real time applications), for which the infinite source hypothesis may cause unacceptable errors. Such a model has already been fully analysed by Jaiswal, but this may yield to very complex computations when applied to real case problems. The same limitation occurs when using a numerical approach. Various approximate solutions have also been proposed. An exact expression of the utilization factor for each customer population is first proved. A simple iterative algorithm is derived and a PASCAL implementation is described. Several examples are presented.